The main purpose of Dropbox is to store and share files so that you can have access to them wherever you are — on your home computer, your work computer, or on your mobile device. You have a couple of different ways to upload your files to Dropbox. First, though, log in to Dropbox with the e-mail address and password you used to register with. In your Dropbox, click Files in the left navigation. If you have folders already set up in Dropbox, navigate into the folder you want to upload your file. If you haven’t set up any folders yet, right-click in the file list area and choose New Folder. Then, give your folder a name. On your hard drive, find the file you want to upload and drag it into the browser window (see Figure 1). Release the mouse button. Your file is uploaded. Figure 1: Drag and drop files into Dropbox. 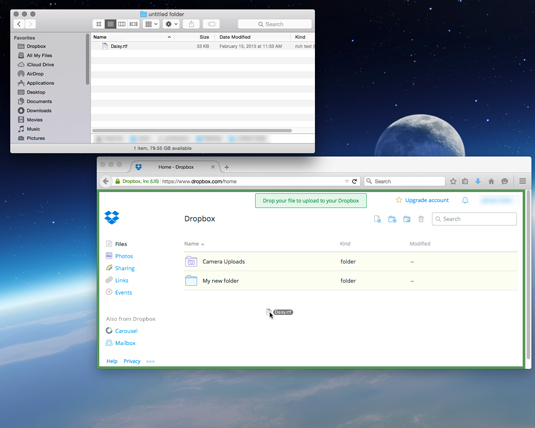 In your Dropbox, navigate to where you want to upload your files. Click the Upload button in the toolbar near the Search field. In the Upload to Dropbox dialogue box, click Choose Files. Browse your hard drive for the file or files you want to upload and click Open. You can choose multiple files. The file is uploaded to your Dropbox and appears in the list of files in the Upload to Dropbox dialogue box. If you want to upload more files, click the Add More Files button to browse your hard drive for more files. If, for some reason, you’re having issues with uploading multiple files, click the Basic Uploader link in the Upload to Dropbox dialogue box. You can then try to upload one file at a time.